A few months ago we saw a massive number of illegal aliens flood the United States-Mexico border as part of the Central American caravan. Mexican President Andrés Manuel López Obrador offered asylum to caravan riders as part of a plan he established, called Estas en Tu Casa (translated to "This is Your Home"). In order to qualify for asylum in Mexico, an immigrant must be in the southern states of Chiapas and Oaxaca. Those who fail to qualify for refugee status can be deported back to their home country. The plan was established to keep people from flocking to the United States' southern border. But now, Mexico is seeing a massive influx of caravan riders, primarily from Honduras. This new caravan was originally supposed to have roughly 2,000 people on it. According to Mexico, that number is now around 12,000, Breitbart reported. 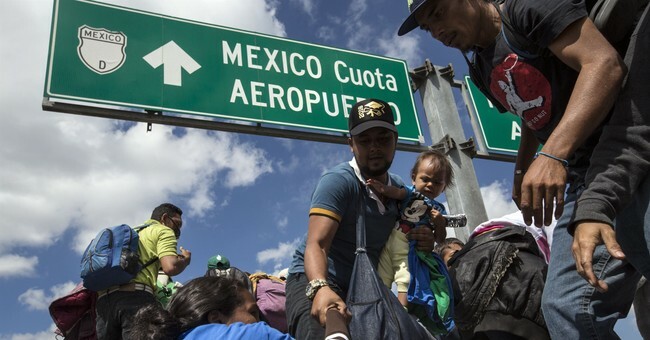 Under Obrador's new plan, those who see asylum in Mexico are granted a one-year humanitarian visa, which allows them to work and travel throughout the country. The new visa program being offered is believed to be the reason more Central Americans are flocking to Mexico, and eventually, the United States. Caravan riders decide to apply for the humanitarian visa in Mexico and work while their asylum application with the United States is being processed. Some, however, are still deciding to cross into America illegally. We're not even a full month into 2019 and already Border Patrol arrests are up 280 percent from the same time in 2018. A couple weeks ago, Border Patrol arrested 247 illegal aliens, something that is becoming more and more common. Right now, the caravan's plans remain unclear. For all we know, they could travel northbound towards our border, where we'd, more than likely, see another stand off with Border Patrol.